General traits: This puchidol is very hard to please and often puts up a dismissive or threatening behaviour towards humans and other puchidorus. On the other hand, when left on its own it feels lonely and secretly wants attention. It has the ability to emit an energy beam from its forehead, strong enough to vaporise cockroaches and blast through concrete walls. It can also use its forehead as a reflector or as a source of lighting. It has been trained by Iori to fire the beam at her command but in some situations it can lose control of the beam, for example when sneezing because of a cold. 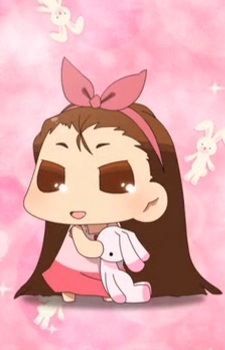 It likes to carry around Iori's stuffed rabbit. Calls: Usually "Moh!" (もっ). When it gets annoyed or upset, it can let out a "Kii!" (キー). When happy or content, it can laugh with a "Nihihi!" (にひひっ).